Five all-new Kias in two years | What Car? Kia's model explosion is set to continue over the next couple of years with five all-new models arriving, including two entries into new segments for the Korean car maker. First up is the funky faux-by-four Soul, which debuted at the Paris Motor Show and goes on sale in the UK during March. You'll be able to read a full report on the supermini-sized Soul on whatcar.com later this week, but it promises more space inside than a Nissan Qashqai from around 11,000. It'll come with a five-year warranty, too. Towards the end of next year, a new mini MPV will also join Kia's line up. As yet unnamed, but code-named YN, this small MPV will rival the likes of Vauxhall's Meriva and the forthcoming Citroen C3 Picasso. It will come off the production line at just over four meters long and a shade over 1.5 meters high. 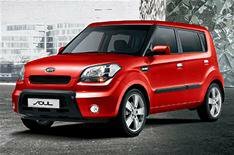 The YN will sit on the same platform as the new Kia Soul, but it will be built in Europe, not Korea. Kia's Slovakian factory will concentrate on the Cee'd and Sportage models, while the YN will be built at Hyundai's new facility in the Czech Republic, alongside the Hyundai i30. There'll be a bigger choice of engines in the YN than in the Soul, with three petrol engines, a 1.4 and two 1.6s, along with three diesel units, two 1.4s and a 1.6-litre. The brief glimpse of the new car we were given reveals a look that resembles a mini Ford S-Max. Its also the first car to significantly benefit from the input of Kia's new design director, former Audi architect Peter Schreyer. The YN might just make it into showrooms by the end of next year, and we'd expect it to start at around 10,500. The new Kia Sorento 4x4 arrives slightly earlier next year (read our world exclusive preview drive here) with a new car-like monocoque construction for improved ride and handling, rather than the more traditional 4x4 body on frame style. It will be offered with either five or seven-seat seats and a choice of 2.4 petrol or 2.2 and 2.0-litre diesel engines. Starting prices should be just above 18,000. In 2010 we can expect an all new Sportage compact 4x4, built alongside a new Hyundai Tucson at Kia's factory in Slovakia. Also due in 2010 will be a new Magentis saloon expect plenty of space for not a lot of cash from this one. Also due towards the end of next year are face-lifted versions of the Cee'd family, while petrol versions of the Cee'd will also get a green makeover featuring Stop/Start technology to slash emissions and improve economy. Cee'd diesels will also get six-speed gearboxes early next year. Kia also hopes to be able to build a production version of the Ex Cee'd convertible concept car, first shown at last year's Frankfurt Motor Show. If it gets the final go ahead, we'll have to wait until after the next generation Cee'd hits the streets well into the next decade.